The ST-70 Touch Screen is a high performance POS Terminal designed for a multitude of Point-of-Sale and other PC-based application needs. With its ‘fan-less’ design, this all in one, compact touch screen station is designed for maximum reliability, essential in today’s restaurant and retail environments. The ST-70 is the perfect combination of style and function, making this terminal the right choice for any POS application requiring state of the art touch screen technology. 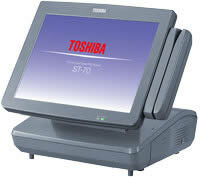 The Toshiba ST-70 and Symphony PRO Store Information Systems. A complete solution for General Retail and Grocery Applications. Crystal Point software and the ST-70 Terminal, the clear choice in restaurant point of sale solutions. TEC POS system terminal is a high performance POS system terminal which has been developed from the Industrial standard PC architecture. This POS terminal provides all register functions required for a specialty store and enables the user oriented system configuration. Intel® ULV Celeron® Processor (650 MHz) is adopted as the CPU. Connectors are provided on the front of the terminal, which make a connection and disconnection of the peripheral equipment easy. Because of no cooling fan, environmental adaptation is increased and noise is reduced. A CompactFlash® (CF), card bus slot, and USB 2.0 interface enhance the connectivity with the peripherals. A compactly integrated POS terminal can be placed in a minimum space of 296 mm (W) x 278 mm (D). A 12.1-inch color TFT is adopted as the operator’s display. A 20-character x 2-line type customer’s display (BIU) can be optionally installed according to customer’s usage. The tilt angle of the operator’s display is freely adjustable in a range of 15° to 55°. A 12.1-inch TFT active touch screen provides wide viewing angle, easy operation to enter order by graphical user interface, and multimedia capability. The terminal is equipped with a 256 MB memory as standard, and this is replaceable with a 512 MB memory. An optional 3.5-inch external FDD and up to two optional 2.5-inch HDDs can be added to the terminal. This terminal has 4 serial interface ports as standard. Among them, the power (+5 and +12V) is supplied to 1 port when using the BIU, and 2 ports when not using the BIU. Besides, 1 parallel interface port is prepared. Various kinds of interface are included as standard: two PS-2 connectors as a mouse interface and PC keyboard interface, 3 USB interface ports, and a 10/100 BASE-T method LAN interface. A VGA controller is mounted on the ENGINE PC board. A 32MB video memory which can display 800 x 600 dots in 64K colors is provided as standard. Windows® 2000 and Windows® XP are available as the operating system. This page is part of GeneralManual.Com Network Toshiba TEC ST-70 POS Touch Screen Terminal User Manual.